BARGAIN DECORATING WITH LAURIE: A GIVEAWAY! This post is published in partnership with Uncommon Goods. I'm having a giveaway! In October, I will celebrate seven years of blogging! Can you believe that? I can't. To celebrate my Blogaversary, I have a wonderful giveaway. Isn't it beautiful? There are so many unique treasures on their site. I had a hard time making a decision. I know you'll want to browse their site. You can find pillows and more home décor here. I kind of got stuck looking at all of the unique pillows. Are you lucky enough to have a friend you can go visit in another state? You might want to take them one of these great pillows depicting their state. (Or maybe you want to just order one for yourself.) I found this one in the Occasions/House Warming Gifts section. You will find treasures in every category (and there are a lot of categories). 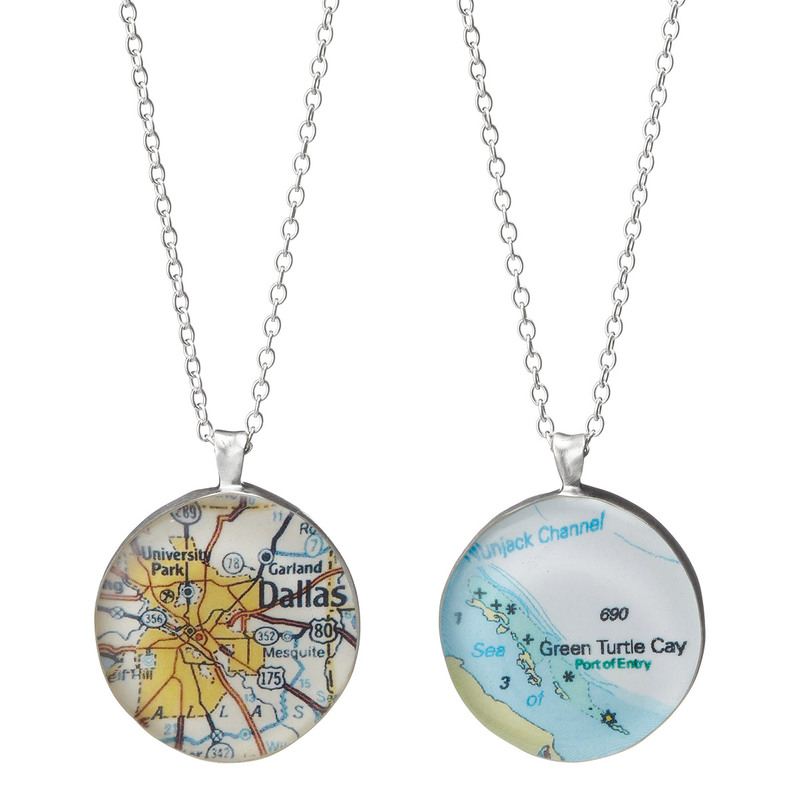 Among the jewelry items are several pieces which can be customized with the map of your choice. Looking for an uncommon wedding gift? 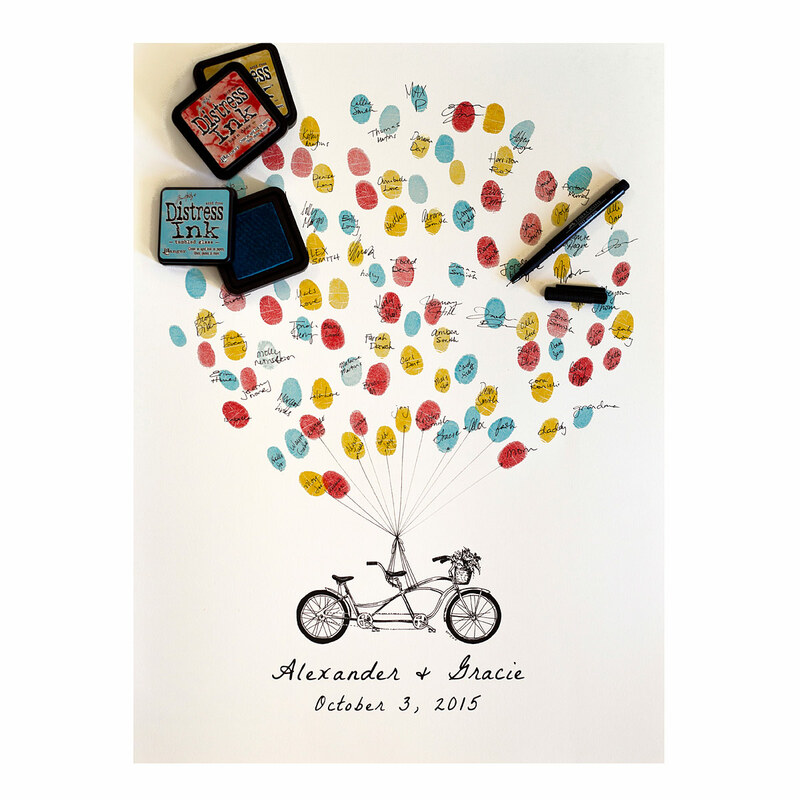 I found this amazing "Thumbprint Guest Book" in the Art/ Style or Medium category. I love this idea. Have you ever bought a gift for a friend and then decided to keep it yourself? I have a confession. I have! Years ago, I bought the cutest frog figurine for my friend who collects frogs. I purchased it several months before her birthday because I had found it on sale. I set it on a table at my house, and as the months passed, I became more attached to that figurine more hesitant to remove the frog from what seemed to be a comfortable habitat for him at my house. I finally decided to get something else for my friend's birthday and let the frog live at our house. Sorry, my frog-collecting friend, Melinda. That's what almost happened when this pillow arrived (more promptly than I had expected after ordering it). I opened it to make sure it was okay and fell in love with it all over again. Then, I made the mistake of putting it on our sofa. Look, it's perfect. It looks like it belongs there. Then I tried it in the brown leather recliner. See how it brightens up the recliner? I think this 19" X 13" pillow could be used almost anywhere. For a chance to pry this pillow out of my hands, just leave a comment on this post. Because I was getting so many spam comments, I previously removed the anonymous option from my comment section, but for this post, I am opening back up for anonymous comments. If your comment does not link back to a way to contact you, please be sure to add your email to your comment. If you win the drawing, and I don't have a way to get your mailing address, I'll be forced to keep the pillow for myself. On Friday, October 2, 2015, after a random drawing, I'll announce the winner. Good luck! I partnered with Uncommon Goods for this post. I am receiving compensation in the form of a product, for the purpose of promoting Uncommon Goods. However, all expressed opinions and experiences are my own words. This post is partying with Met Monday at Between Naps on the Porch, Inspire Me Tuesday at A Stroll Thru Life, Tweak it Tuesday at Cozy Little House, Table It at Rustic and Refined, and You’re Gonna Love It Tuesday at Kathe with an E.
Oh my goodness it is beautiful! I adore Uncommon Goods, they have the most delightful items that are perfect for anyone. Lovely giveaway... and yes I have purchased a gift for a friend and then kept it for myself...but luckily I was able to purchase another one of same item for them which helped with my guilt...LOL Thanks for the chance to win and congratualions on 7 years of blogging! I agree with you, that pillow would be hard to give up! Its beautiful. Congrats on your blogging anniversary! What a precious il low and how kind of you to be willing to share it with us, I would love an opportunity to own this beauty! Congrats on your blog anniversary! I can see why you would have a hard time giving this sweet pillow away! Don't enter me in the contest...I don't need another pillow, but I just wanted to say happy blog anniversary! This is a lovely pillow and it would look great on my living room couch. I have bought many items from Uncommon Goods,they have so many unique items. Happy Anniversary! I wish I had found you years ago. Your blog lets me keep in contact with my hometown I love your home and had hoped to meet you at the reunion, but alas the week of the reunion is about the time that they should be working really hard on my kitchen remodel. I have waited 40 years for this and really need to be here to enjoy the room. By the way, I went to a couple of small antique malls near me and found some embroidered towels and scarves like the wonderful pillow that you are showing. Happy Anniversary. I just bought a new living room chair this weekend and this would look great on it! Although, I would probably lose it to my little girl who has been studying states and would love a state pillow! Thanks for the opportunity to enter! Congrats on your 7th year blogging anniversary, I think I started reading your blog right after you first started. I love your blog and all the neat pictures you post, and your funny commentary that goes with it. The pillow is really pretty. Oh, the pillow is wonderful! I started reading your blog a while back and find it so inspiring! Thanks for the giveaway! Congratulations on your blog anniversary, and thank you for the chance to win this darling pillow. I can certainly see why you were tempted to keep it, and I admire your resolve in publishing this post. I'm a new follower of your blog but since I'm a fan of bargain decorating, I think I'm really going to enjoy reading your posts. I've just recently found your blog but am very glad I did! I have lots of posts to catch up on! Hi Laurie, Congrats on your blog anniversary. It sure flies by fast doesn't it? Wishing you many more years of fun blogging. What a great giveaway. 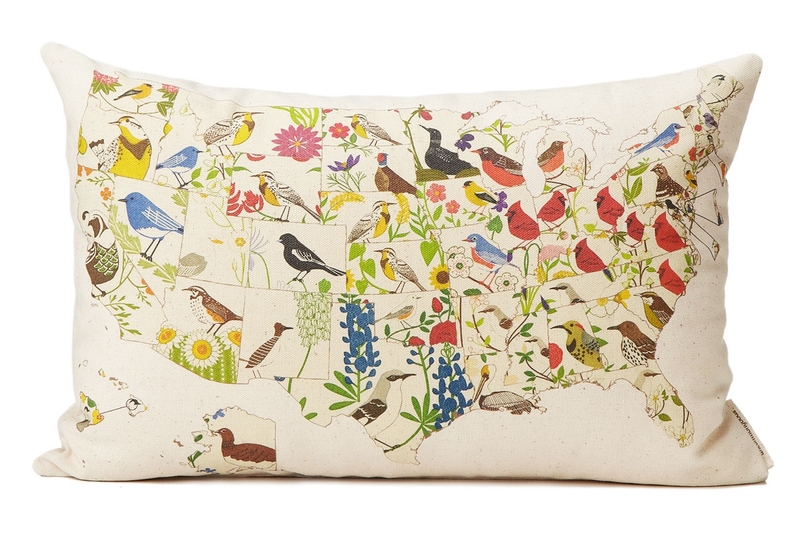 Love the Map pillow with the birds for the states. You are right, it would look great in any decor with the colors. It looks gorgeous on your leather sofa. Thanks for having a great giveaway. Great posts as always love the pillow too. Laurie, I always enjoy visiting your blog. Bargain decorating is the only kind of decorating I do! And I love birds, so this pillow would be perfect for me! Thanks for giving us a chance to be the lucky recipient. What a beautiful pillow! Thank you for a chance to win such a lovely giveaway! 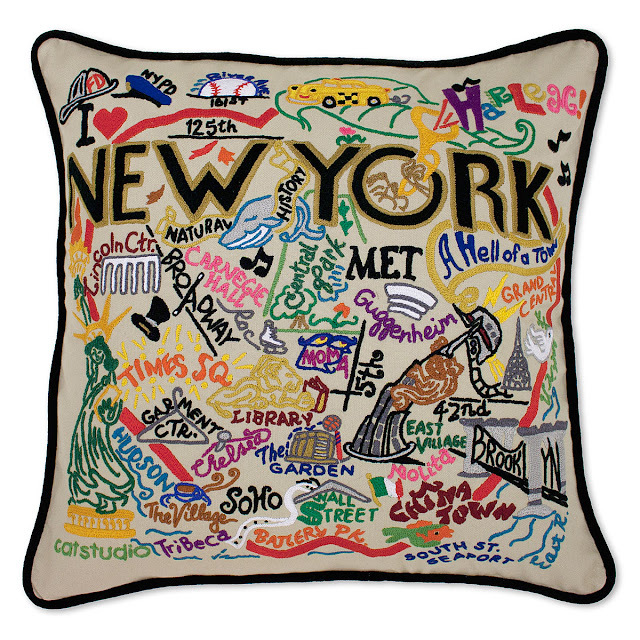 I love Uncommon goods and this pillow...GAH! How adorable is it! Here's to hoping I win it! I have the perfect spot! I love Uncommon Goods! I have ordered gifts for Mr. B from there and you are right, they arrived in no time! I can picture that pillow on our bed already ;-) Fingers crossed! What a pretty pillow and it would look great in my family room. I never purchased anything from Uncommon Goods but, I plan to check them out. What a beautiful pillow...can think of a few places I could place it in my home. I need to check out Uncommon goods. Looks like a shop I could have some fun. I love your blog, love looking at color and creativity. So fun. You are my fix when it comes to dishes. While I love them I don't purchase them very often. Those are amazing!! I would happily take it off your hands. What a beautiful pillow! The colors are so much fun! Love that pillow. It would be terrific in the guest room. Out-of-staters would feel just a little bit more welcome! Laurie, absolutely love this pillow. Not familiar with Uncommon Goods so let them know your post and giveaway is working to spread the word. Count me in. Love 6he pillow. What a beautiful pillow with the state birds and flowers....thanks for the give away opportunity! Such a gorgeous pillow! I have never seen a design like this. As a bird lover, I adore this pillow. Fantastic giveaway. I love all you decorating ideas and skills. You inspire me on so very much and would love to have this pillow for house. Love love love all you do!! This is a beautiful pillow. What an awesome giveaway! Would love to win this beautiful pillow!